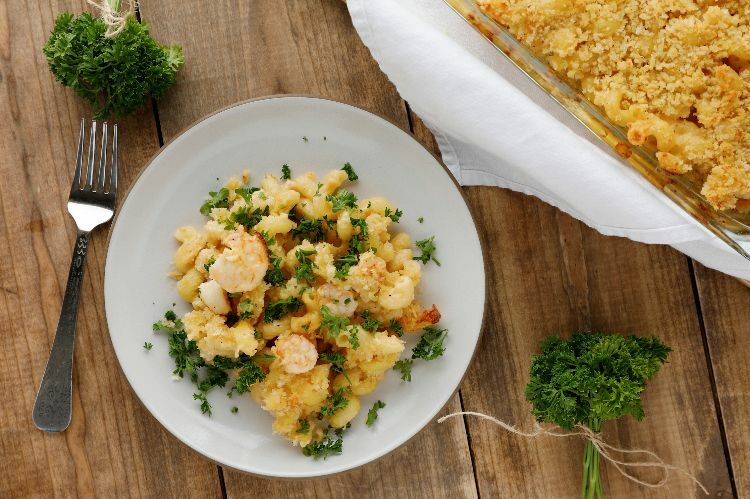 Being a huge fan of anything that is loaded with cheese, one of my favorite things about Southern cuisine is that mac and cheese is considered a vegetable. With the recipe below, it can count as a main dish as well, making it a totally sublime one-bowl meal. As far as I'm concerned, the two things a good mac and cheese can't be without are a crunchy breadcrumb topping and a hit of spice. This version has both, as well as plump, juicy prawns sautéed in butter. How can you go wrong? 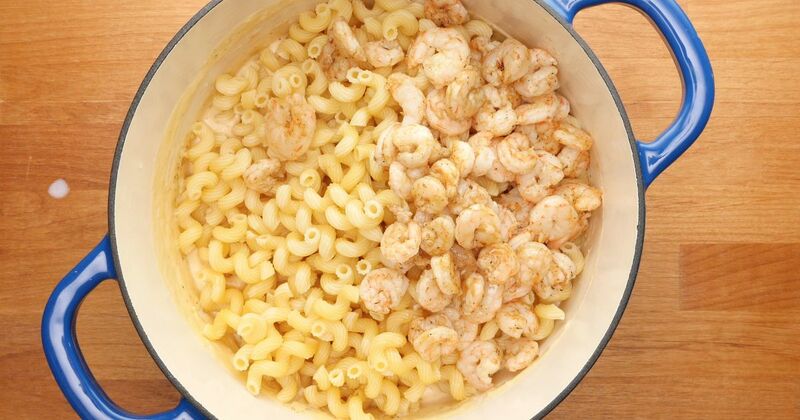 To prepare the shrimp, melt the butter in a large skillet set over medium heat. Add the shrimp and seasoning and cook, stirring occasionally, for about 4 minutes, until the shrimp is cooked through. Remove the pan from the heat. To prepare the pasta, melt the butter in a large saucepan set over medium heat. Whisk in the flour and cook, whisking constantly, until the flour starts to brown, about 5 minutes. While continuing to whisk, add the milk in a slow, steady stream and bring to a simmer. Stir in the cheeses, one type at a time, stirring after each addition until it is melted and incorporated before adding the next. Stir in the seasoning and add salt and pepper to taste. Remove the pot from the heat and then stir in the cooked pasta until well coated. Transfer the pasta and sauce to the prepared baking dish. Make the topping by tossing the melted butter with the bread crumbs and parsley until well-combined. Sprinkle the mixture evenly over the pasta in the baking dish. Bake in the preheated oven for 15 to 20 minutes, until the top is lightly browned and the sauce is bubbling. Remove from the oven and let sit for about 10 minutes before serving.